A hybrid smartwatch which combines the functionality of an analog clock, with intelligent functions. 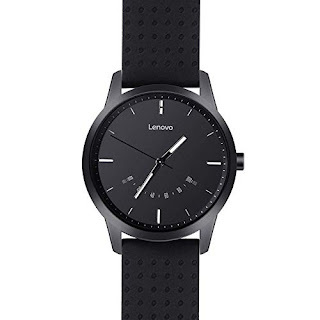 The Lenovo Watch 9 is a hybrid smartwatch which combines the design and functionality of an analog clock, with intelligent functions. Unlike other smartwatches, the Watch 9 has no screen. It connects to the smartphone through a dedicated application. In addition, vibrates to inform us of notifications, is water resistant and compatible with iOS and Android. One of the things that distinguish the Lenovo 9 Constellation Edition watch from many other smartwatches loaded with available functions is its 5ATM waterproof classification: it supports pressures equivalent to the depth of the 50 meters, which makes it a charm when exposed to the rain, splash, shallow, swimming. Generally, smartwatches are usually quite expensive devices. They have OLED screens, many sensors, and even their own operating system. However, not all users need all these features. Hence, the quantifying bracelets and other options arise. For this type of users is the Lenovo Watch 9. You can precisely control pulses and the active and resting heart rate changes to generate a professional heart rate report. When you get it paired with your smartphone via Bluetooth, you'll be able to synchronize your data with your Android phone and your iOS phone. Through this watch, you'll get a real-time evaluation of your exercise throughout the day. When you get curious about the quality of your dream then the sleep monitor function will give you the answer. It tells you with vibration when a call or message arrives, you never need to worry about losing calls or important information. Do not be afraid that your alarm will wake others up because this vibration function simply wakes you up. On the front, it has a sapphire crystal with a 9H hardness. The rest of the body of the watch is made of stainless steel, while the strap is made of silicone. The duration of your battery is no less than 12 months with a single charge.